I put a wink in the title of my new workshop. I did. And it made me WORRY. Luckily I had a deadline and I had to decide quickly. Otherwise, I could’ve spent hours making the decision. Revising it. Making it again. And revising it again. Decision making is my number 1 procrastination thing at the moment. I’m afraid to make mistakes. So what’s so scary about putting a wink in a workshop title? Well, nobody ever does that. It is not common. So people might think all kinds of things about me: that I’m childish, weird, whatever. (Strange, when you try to write out a worry that’s in your head it sometimes becomes a lot smaller. Was this all that I was thinking? Wow, I could’ve spend less time on that then). For me, this whole decision making process procrastination tendency (please read those words again, don’t they combine lovely?) feels like a tragedy. Not funny at all. I waste so much time and energy trying to make decisions that it’s sad. Not to mention how if makes me feel: stupid, stupid-stupid-stupid, and more stupid. (Of course, this also goes with inner dialogue like: everybody else makes decision easily, it’s my mistake that I can’t do that, why can’t I be like everybody else, etc.). Luckily, I’ve learnt to take myself less seriously than I used to. I know everybody has these inner dialogues. Or at least lots of people… I also know that part of these worries may be my cortisol level speaking. Cortisol is a stress related hormone, and an overdose of it can make you fearful (short and flawed summary of a lot of scientific reserach, I hope you get the picture). I also learnt that many things are small, even when they look really big before they happen. 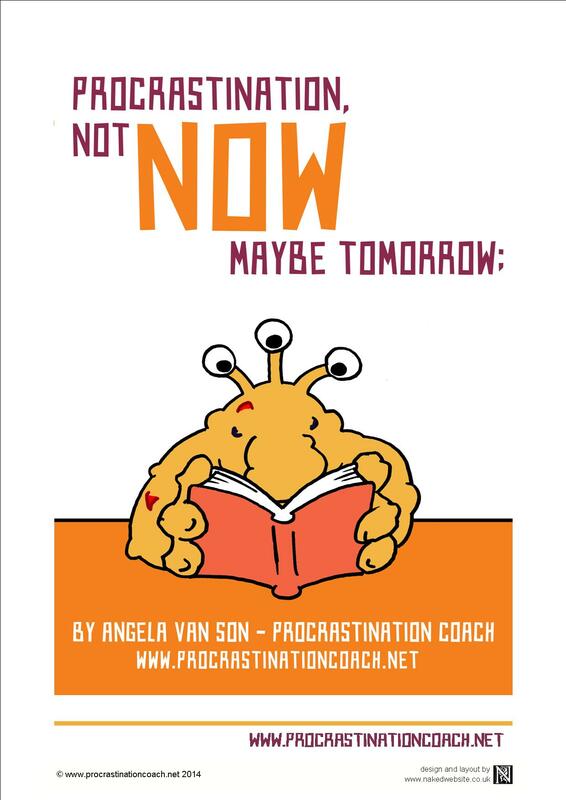 And I’ve learned some really good strategies for dealing with procrastination. My favourite one for deciding at the moment is to delegate all unimportant decisions. Most of them really aren’t worth the trouble (Do I want coffee or cappucino? I don’t know!). All of that still doesn’t make procrastination funny. But if you’ve spent some time on the internet, you probably know that there are many cartoons on procrastination. Some funny videos. Somehow, procrastination is a funny phenomenon. So many people do it, it’s part of the human condition. Haha, I just caught myself thinking that I can’t publish this post before it’s a funny post. Apparantly I think the post should be funny, or at least witty. That’s not going to happen today. So without procrastination, I will click on the button to publish this post. Not funny, not funny at all. But I’m smiling, at not being stuck. And that’s good.